These days I work on setting up several development lifecycle environments for BPM, SOA and OSB. What means that we setup servers for Development and test, culminating eventually in supporting the setup of the acceptance and production servers. Since we want to have development resemble production as much as possible, we installed a dual-node clustered BPM environment, including BAM. However, since it is development, we have the two Managed Servers per cluster on the same phsyical (actually virtual) host. In 12c BPM introduced a new component the Process Asset Manager, as described here. But installing BPM on a dual node cluster on a single host, will give problems with the underlying BAC/Subversion Component. [Deployer:149193]Operation "start" on application "BPMComposer" has failed on "bpm_server2". [Deployer:149034]An exception occurred for task [Deployer:149026]start application BPMComposer on bpm_cluster. : weblogic.osgi.OSGiException: Could not find bundle with Bundle Symbolic Name of:org.tmatesoft.svn.core. Make sure that all 4 ports are different. Do a netstat on the machine and check also that the ports used by BAC servers are not already in use. Change them if necessary. You see that the latest port, the AdminPort belonging to the empty AdminAddress on the bpm_server1 is listening on 0.0.0.0, in affect on every address. Apparently, it is not possible to set an explicit address. Since it is on one actual host, the bpm servers are attached to different virtual IP addresses. 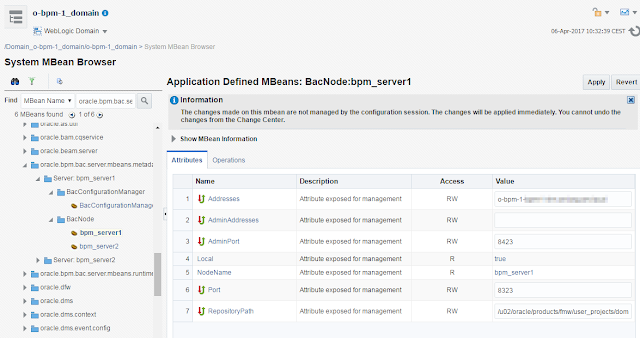 Now, this enabled us to start both the OracleBPMBACServerApp as well as the BPMComposer. This occurs just on one of the two servers, in our case bpm_server1. Apparently, the Bac server can't run more than once on the same host. Or, in an active-active configuration, one of the bpm servers does not know how to connect. I don't know yet, how it is supposed to work internally. Then restarted the bpm servers and the BPM Composer and the underlying PAM/Bac/Subversion were working on both servers. Please refer to http://blog.darwin-it.nl/2017/11/bpm-bac-subversion-server-refusing.html for a patch on this problem.